← BEYOND…one word, express in one hundred words in one hundred days. WORRY…one word, express in one hundred words in one hundred days. Worry Is The Lack Of Faith And Inability To See The Help That Is Around. Trouble Don’t Get Stronger, They Get Weaker As Time Flies. In Life You Will See Trouble If You Worry You Will Make Them Double, They Later Become Bundle. The Only Way To Handle Situation Is To Put Your Trust In God. Trust Is The Cure For Worry. If You Cannot Afford Camry Just Buy Lorry. Everything Will Change As Long As You Nurse Your Dream And Vision. 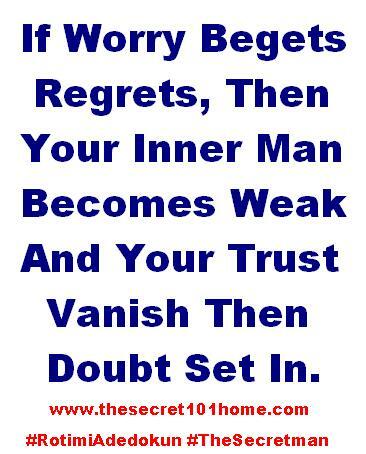 If Worry Begets Regrets, Then Your Inner Man Becomes Weak And Your Trust Vanish Then Doubt Set In. This entry was posted in Self Development, Spirituality, The Secret, Vitamin Of The Mind and tagged Bishop David Oyedepo, Bobby Mcferrin, Don't Worry Be Happy, How To Trust In God, Jim Rohn, Pastor E A Adeboye On Worry, Psalms 126:1, Those Who Trust In The Lord. Bookmark the permalink.